Israeli police say four people were killed by knife-wielding men at a synagogue in Jerusalem on Tuesday. 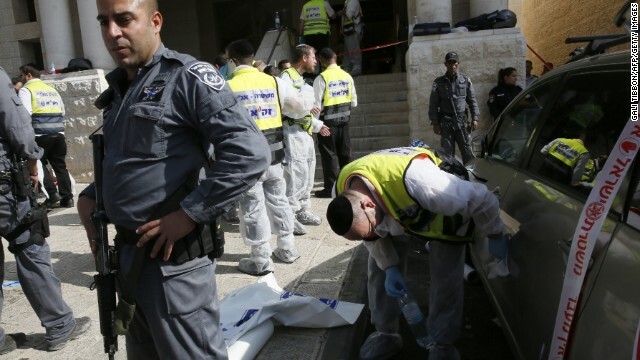 Knife-wielding men kill Israelis at a Jerusalem synagogue. Missouri's governor calls for a state of emergency. And a Navy vet said he was called a terrorist for posting pics of federal vehicles on social media. Conflict flares again: Two knife- and axe-wielding Palestinian men broke into a Jerusalem synagogue Tuesday morning and killed four worshipers, Israeli police said. Israel's prime minister issued a firm response: "We will respond with a heavy hand to the brutal murder of Jews who came to pray and were met by reprehensible murderers," Benjamin Netanyahu's office said. The latest violence comes after the death of a Palestinian bus driver in Jerusalem who died under disputed circumstances. State of emergency: As the country waits for a grand jury's decision on whether to indict the officer who killed Michael Brown, Missouri has both called in the National Guard and has diminished the role of the Ferguson Police Department. Missouri Gov. Jay Nixon declared a state of emergency Monday as a precaution, he said, in the event of unrest or violence. Who are you calling a terrorist? A Navy veteran in Missouri said he was fired from his hotel job and called a terrorist for posting pictures to Facebook of Homeland Security vehicles massing near Ferguson. "The head of security for Drury was in there, and he pretty much called me a terrorist, saying that I dishonorably served my country for posting those pictures and videos on Facebook," Mark Paffrath said. The Drury Hotel said it couldn't comment on the case. Slippery economy: So Japan has slipped into a recession. And the prime ministers says he's going to dissolve parliament and call for snap elections. What does all this mean? Another woman comes forward: A woman told CNN's Don Lemon that Bill Cosby sexually assaulted her 45 years ago, when she was a teenager. Joan Tarshis, a journalist and publicist, said she met Cosby in 1969 in Los Angeles when she was invited to have lunch by some friends of his. "I woke up or came to very groggily with him removing my underwear," she said of one alleged incident. Cosby has repeatedly said the allegations are untrue, and he has never been prosecuted. So one of the 5 things we need to know is not Jonathan Gruber and the ACA? I am disappointed in you all at New Day. I guess you are taking orders from the White House. Sad. You are supposed to be a news organization, not an arm of a political party or a one viewpoint. Yeah!! no cute videos..who didn't show up for work? I missed the animal/baby happy videos at the end! It starts my day out right! The important fact is that Mark Paffrath never posted a location. Had Drury never made a big deal of it, nobody would have known. Then to insult a serviceman who served his country is an insult. I'll bet the security manager never even served. I for one will not be staying at Drury, nor will any of my staff. Where are the animal videos???? What? No Bonus stuff from around the internet? Oh what a disappointment. Not one uplifting, cheerful or funny topic or video to brighten the day? There has to be something to bring a smile to one's face in this otherwise sad world.